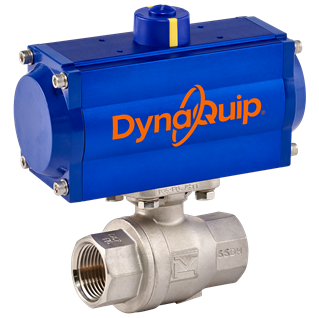 DynaMatic electrically automated valves offer convenient and economical assemblies that cover a wide range of flow control applications. Our assemblies are available in several valve materials, configurations, and voltages to suit your automation needs. Click on a Series to view additional details or click on Search By Specification to explore all available assemblies based on required specifications (size, voltage, metallurgy, etc). 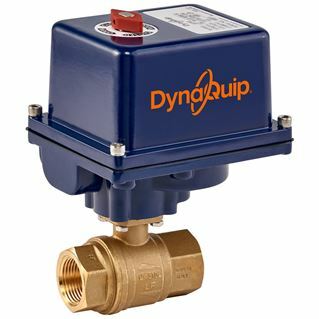 For your needs in pneumatic actuation, DynaQuip offers a wide variety of air actuated valve/actuator assemblies. All air actuated DynaMatic assemblies use our HP series pneumatic actuators available in both double acting (air/air) and spring return (air/spring). The spring return models can be ordered in either the fail closed or fail open configuration. Optional direct mounted pilot solenoid valves reduce response time and allow for efficient operation. Other common assembly options include valve position limit switches, pneumatic or electro-pneumatic positioners and speed controls.